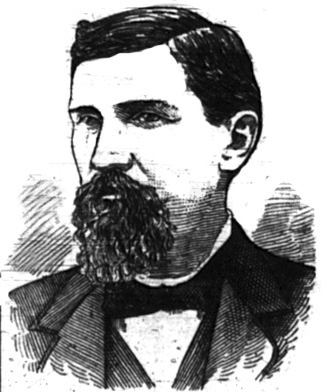 Murder by Gaslight: Three Iowa Murders. Davenport Woman Convicted of Killing her Husband. 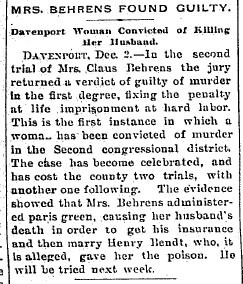 Davenport, Dec. 2.—In the second trial of Mrs. Claus Behrens the jury returned a verdict of guilty of murder in the first degree, fixing the penalty at life imprisonment at hard labor. This is the first instance in which a woman has been convicted of murder in the Second congressional district. The case has become celebrated, and has cost the county two trials, with another one following. The evidence showed that Mrs. Behrens administered paris green, causing her husband’s death in order to get his insurance and then marry Henry Brendt, who, it is alleged, gave her the poison. He will be tried next week. 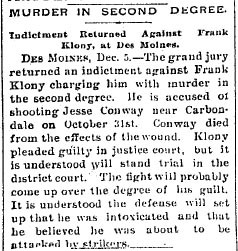 Indictment Returned Against Frank Klony, at Des Moines. Des Moines. Dec. 5. 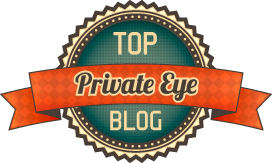 –The grand jury returned a verdict against Frank Klony charging him with murder in the second degree. He is accused of shooting Jesse Conway near Carbondale on October 31st. Conway died from the effects of the wound. Klony pleaded guilty in in the justice court, but it is understood will stand trial in the district court. The fight will probably come up over the degree of his guilt. It is believed that the defense will set up that he was intoxicated and believed that he was about to be attacked by strikers. Cedar Falls, Dec. 7.—Fred Six, a young farmer residing at Niles Corner near Green, was found dead with a bullet hole through his head and a revolver lying near. It is not believed to be a case of suicide, as Six was shortly to be married and was of a happy disposition.